There are 90 species of antelope. Are very fast runners and escape predators by leaping. Can reach speeds of about 95 km per hour. Horns grow to about 5ft long. Mating season is known as Rutting Season. Prefer to live in herds, which are often extremely large. Live for between 8 - 10 years in the wild. Impalas are capable of jumping 10 feet into the air when threatened. 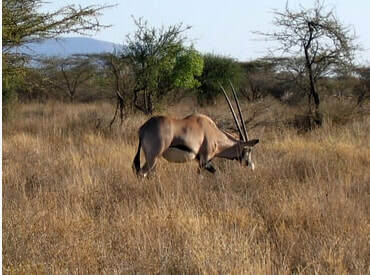 Male Eland antelopes let other males know how tough they are by clicking their knees. The Dik Dik grows to between 30-40cm at shoulder height. The Generuk (known as the Giraffe Gazelle - translated from Somali - or Waller's Gazelle), is a long-necked species of antelope. It is found in the dry thorn shrubland and desert in the Horn of Africa and the African Great Lakes region.